Posted on January 8, 2018 at 2:52 am. Allergies are the commonly reported problems when it comes to indoor air quality. Whether you’re just having the symptoms or you’re already experiencing somewhere in between mild and extreme allergy condition, the technicians at Texas Made Air Conditioning and Heating recommend a home air filtration system to keep your indoor air quality safe and healthy. How Does An Air Filtration System Work? HEPA Filter. When it comes to filtering microscopic and harmful air chemicals, you can always count on a HEPA filter. Because of its greater efficiency in trapping microorganisms such as bacteria, they exceed the test procedures even for the highest MERV rating. Aside from the filtering chemicals and airborne particles, the waves of activated carbon based materials present in HEPA filters can also absorb bad odors. UV Light. It is mostly used in conjunction with a good air filtration system. UV lights do not trap or filter harmful chemicals but these are excellent tools in killing harmful microorganisms such as bacteria and viruses present in the air. Media Filter. 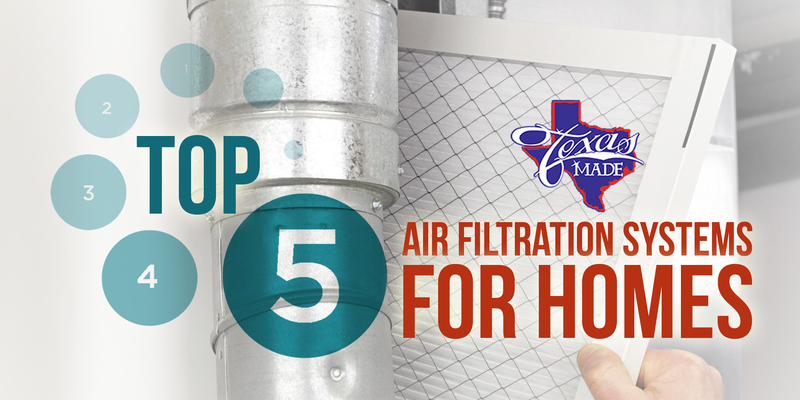 If you are using a 1” air filter, think of upgrading it to media air filtration system. They can trap airborne particles such as dust, spores, pollens and other contaminants up to 40% more efficient than traditional 1” air filters. On Demand Air Purifiers. As compared to media filters and other types of air purifiers, on demand air purifiers can work even if your air conditioning unit or furnace system is off. This is especially important when the allergy season starts and you need more from your air filtration system. UV Light with Air Purifier. The combination of air purifiers and UV light technology is an effective air filtrate system. Some solutions even remove zapped contaminants to prevent them from recirculating in the air. Contact Texas Made Air Conditioning and Heating to learn more about air filtration system or to schedule installation and maintenance service for your heating and cooling units.